I'm teaching a workflow class today at Santa Rosa JC, and one of my big time saving tips is to rate your photos right after upload, then only image edit the best of them. 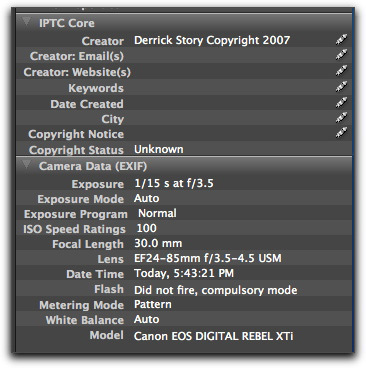 I've noticed that photographers who don't religiously rate their photos (using Bridge, iPhoto, Aperture, Lightroom, etc.) often waste their time working on pictures that they'll never use anyway. The basic workflow of upload, add metadata, rate, sort, image edit (only the best), output, and archive is still the most efficient system I know. Shot the scene in a correct exposure according to our usual workflow. Repeat the shot now reducing shutter speed by 4 f-stops that will be corrected in the RAW development. Blend in some way both images obtaining a free of noise final image. This is not a technique for casual snapshooting. It requires a tripod and attention to your settings. But the examples are compelling, and I think it's worth testing further. The August photo assignment is Intersection. Make sure your entries are turned in by the end of the month. Tomorrow, I'll post the results from the July assignment (pattern). It's a great looking gallery, and I know you'll enjoy it. One of the small improvements that make a big difference for me in iPhoto '08 is its improved Import window. 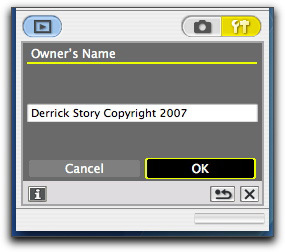 In prior versions you had few options, including not being able to pick individual images to import. 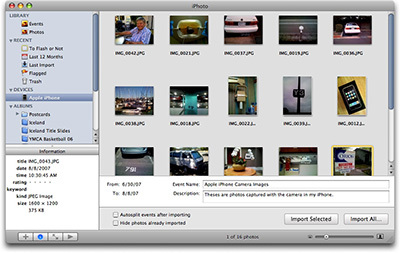 Now, when you connect your camera or iPhone, you're presented with a helpful window that displays your thumbnails and basic metadata in the Information pane. You can enlarge or reduce the thumbnails with the image size slider, add a custom Event name and description, then import selected images or all of them. iPhoto '08 even has a nifty "Hide photos already imported" checkbox that works great. I've yearned for a more sophisticated Import dialog from iPhoto for a long time. This latest version finally scratches that itch. I outgrew my FireLite 160 GB like a 10-year-old outgrows his jeans, and I needed a bigger portable hard drive to store my current Aperture library. I wrote about this adventure recently in the piece titled, Latest Stop on the Quest for Portable Storage. 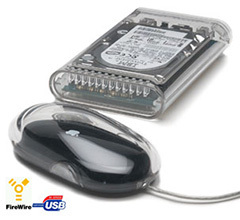 This pursuit led me to the OWC Mercury On-The-Go FireWire 800/400 + USB 2.0 2.5 Portable Hard Drive. My big decision was between the 200 GB / 7200 RPM / 16 MB cache model for $349 or the 250 GB / 5400 RPM / 8 MB cache version for $299 US. (You can see an overview of all these models on this page.) Even though I would have loved the 7200 RPM model, I opted for the slower 5400 RPM version that had 50 GBs more storage. The OWC drive comes with 2 FireWire 800 ports, a FireWire 800 cable, FireWire 800 to 400 conversion cable, and a USB 2 port and cable. Even though it's bus-powered, the kit includes an AC adapter. I haven't used the adapter nor plan to unless necessary. The drive is packaged in an attractive clear case with a sizable heat sink exposed on one side. The heat sink did get rather warm while copying my 160 GB image library over to the OWC drive. But then again, that's its job. The drive has performed well connected to my MacBook Pro's FW 800 and FW 400 ports. I used it for hours while working on the wedding shoot, and it kept up fine with my pace. The drive fits easily in my laptop bag, and boots up quickly when connected to the computer. My only complaint? I hate the cheesy fake leather cases the OWC provides with their portable hard drives. It's a one-size-fits-all model that looks like a throw-back from the 1960s. This robust drive deserves a better home for travel. Aside from the case, I recommend the OWC 250 GB portable drive for photographers who need lots of storage in a tough, compact package. According to the discussion on Nikonians forum, Capture NX 1.2 is primarily a maintenance release. You can read all the details about both the Mac and Windows version over at Photography Blog, where they list a whole slew of minor improvements plus links to download both Mac and Windows versions. Just announced iPhoto '08 includes plenty of great new features, such as improved web galleries, event-based organization, and theme-based home printing. I think these additions are useful and will be welcomed by iPhoto users. But I'm particularly enthused about the overhaul of the Adjust palette with the inclusion of Highlight and Shadow sliders. These are professional-level tools that can really help you improve your pictures. 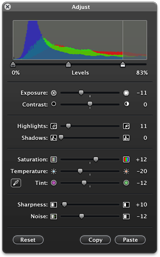 If you look closely at the new Adjust palette, you'll see that the Histogram is at the top with full Levels controls similar to those in Photoshop. The previous Levels control in iPhoto was missing the all-important "gamma" slider in the middle. That's been fixed. Below Levels are nine slider controls. 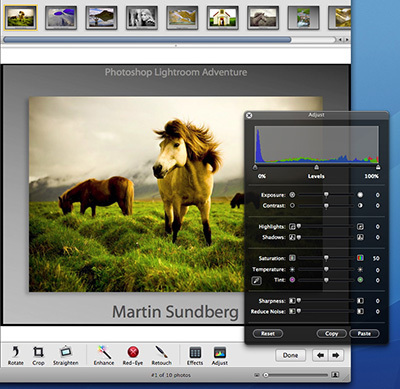 The top two sliders are Exposure and Contrast (replacing Brightness and Contrast). The combination of these sliders, plus the improved Levels control, gives you powerful options for overall exposure adjustment of your pictures. Next, you'll see the Highlights and Shadows sliders. These are helpful for recovering blown-out highlights and plugged-up shadow areas in your pictures. Highlights and Shadows are very important controls for digital photographers working in contrasty light. The next group of sliders -- Saturation, Temperature, and Tint -- are the same as before, except now you have an auto white balance dropper. This is really handy for quickly correcting images that are too cool or warm. Simply click on a neutral area with the dropper to correct the image's white balance. The last set of sliders are Sharpness and Noise (replacing Sharpness and Straighten). Straighten is still available, but it's been rightly relocated outside of the Adjust palette. Including noise control is another professional level tool that I think iPhoto users are going to appreciate, especially those who shoot with compact cameras at higher ISOs. Lastly, there are now Copy and Paste buttons at the bottom of the Adjust palette. These enable you to copy image adjustment settings and apply them to multiple photographs -- very handy for a series of images shot in the same lighting condition. I think the improved Adjust palette is a truly a highlight for iPhoto '08. Photographers now have the most vital image editing controls right there in their digital shoebox, eliminating the need to roundtrip to outside applications for the bulk of their editing work. The new iPhoto is part of the iLife '08 suite of applications, and is available now for $79 US. 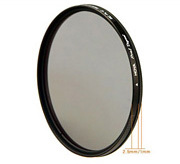 The polarizing filter is still the "must have" accessory in our camera bags. White balance settings may have replaced the 81A and other correction glass, but the need for the polarizer lives on. Polarizer as a Neutral Density Filter. "Polarizing Filters" - Digital Photography Podcast 84. "Sunglasses" Polarizer in a Pinch . Low Horizon Line for Dramatic Skies. I'll be speaking at the Stanford/Palo Alto Macintosh Users Group (SMUG) on Monday evening, Aug. 6. I'll begin with the topic, "iPhoto 6: More than (Initially) Meets the Eye." iPhoto is a solid photo management application that ships on every Mac. But there's more to this program than initially meets the eye. I'll show you how to become a iPhoto power user and unlock some of its magic. Then I'll move into "Techniques for Great Pictures." Digital photography is like any computer-related activity: the data you input has great impact on what comes out the other side. Good data in, good results out. You might not realize it, but your digital camera is a sophisticated data input device (that also happens to be lots of fun). And it becomes even more enjoyable when you learn how to tap its vast creative potential. The Stanford User Group meeting is open to visitors, so you're more than welcome to drop by for the evening. The event begins at 6:30 pm with a general Q&A session, then a talk on Shareware at 7:00 pm, and I take the floor at 8 pm. If you're in the Palo Alto area (Northern CA, USA), it's easy to get to the event (right off the 280 Freeway). Here are the directions to SMUG. Hope to see you there! More Events! See the TDS Event Calendar for more photography workshops, speaking engagements, and trade show appearances. I'm a big fan of interesting photo essay's, especially works that have text that's as engaging as its images. Gary Gladstone, who had been a professional shooter for years, recently published Portraits from the Heartland. 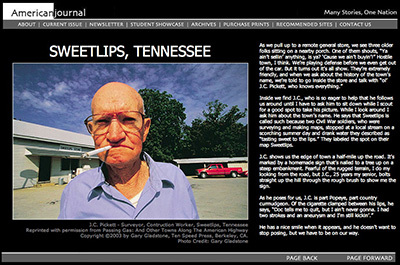 Unlike his former corporate images, Gary's Heartland portfolio includes portraits from locations such as Peculiar Missouri, Goofy Ridge illinois, and Sweetlips Tennessee (one of my favorite images, shown here). Gladstone's portraits are terrific, and the entire collection of photos is both entertaining and inspiring.